My aloe vera obsession just won't stop! 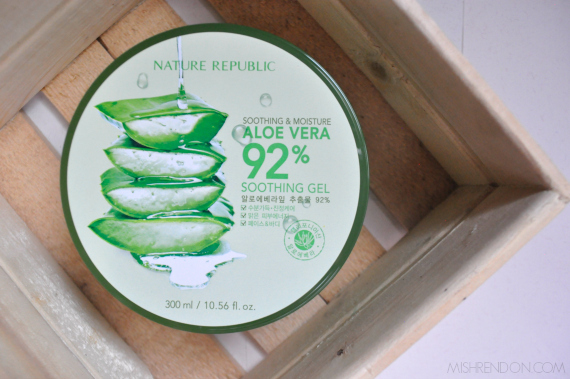 After trying out The Face Shop's Jeju Aloe Soothing Gel, I got myself several tubs of Nature Republic Aloe Vera 92% Soothing Gel during my recent Althea Korea shopping experience. I actually wanted to try out this one when I first got acquainted with Althea (earlier this year) but I was already eyeing a different kind of day moisturizer on my second haul. Nevertheless, I decided to stick with aloe gels because they've worked out well for me. As regards the packaging, I can't say that I was happy with it. I like that it contains a whole lot of product, but I am not satisfied with how it was presented. The product is contained in a tub container with a twist cap. I find this one unhygienic to use since you have to dip your fingers into it. I just make sure to use it after washing my hands to keep it clean. Otherwise, you could also use a spatula if you don't like dipping your hands into the product. I actually tried transferring the product into a spray bottle but its too bothersome to do. 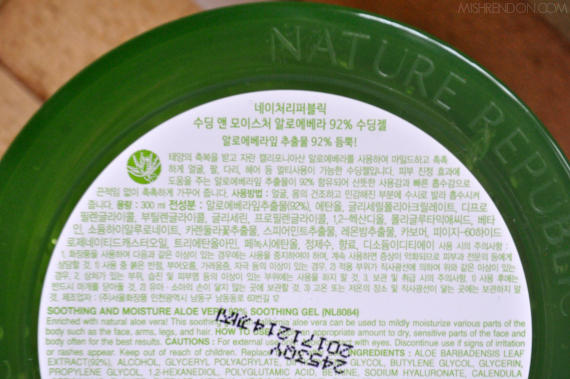 Both instructions and ingredients are in Korean and English (I think haha!) and the expiration date is printed at the back. I still have a whole lot of product to finish before it expires next year. 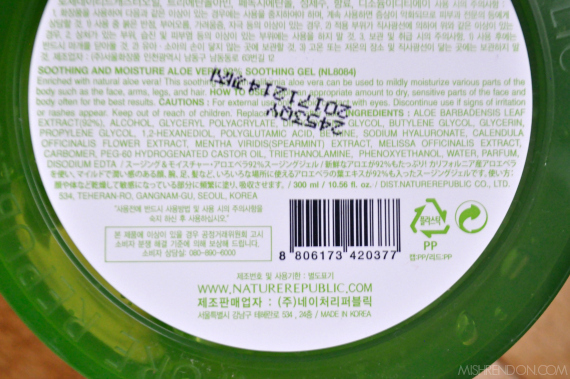 Although I don't read ingredients and instructions that much, it also helps that Korean skin care brands now have translation of those details. As regards the product itself, I have mixed feelings towards it. The product has a nice consistency. 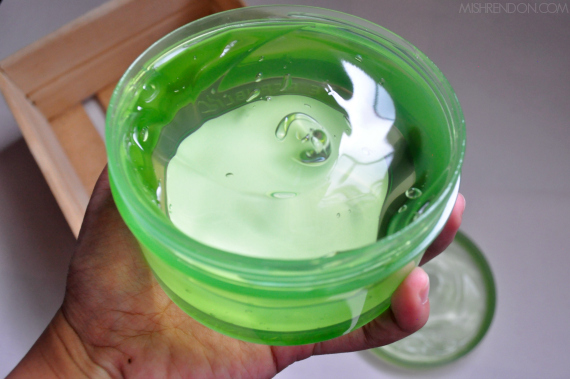 The gel is kind of thick at first then becomes runny when applied. I love how this one does not have stickiness after it dries. I place the tub inside my refrigerator so it's extra cold when I apply it on my face. The problem I had with this is the amount of alcohol it contains. It has a faint alcohol smell when applied that subdues after a few seconds. I used to put it on my skin twice daily, but I noticed that my skin feels burned after continuous use (you know that stinging feel especially on the top of your lip). I stopped using it for a while and that burning feeling was gone. I only use this now once or twice a week as a pack. 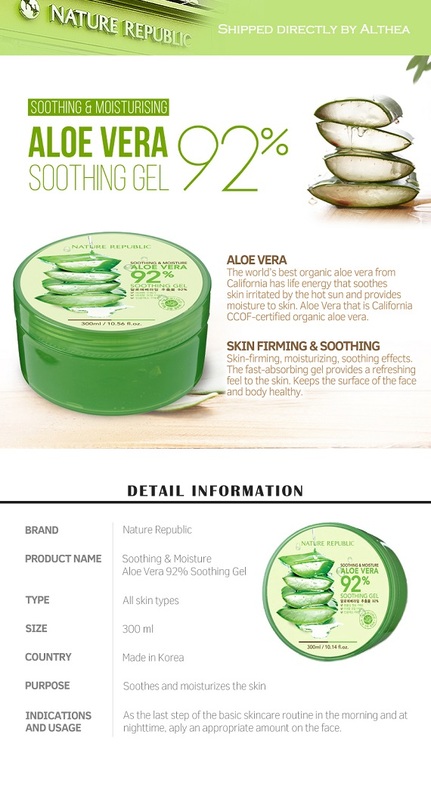 I didn't have such experience with The Face Shop's Aloe Gel so I was kind of surprised that this product didn't work for me that much. But I am relieved that this can be used all over the body (even the hair!) so it's not really a waste of money.